It is official. The Corinthia Hotel has magically transformed me into a Christmas lover. 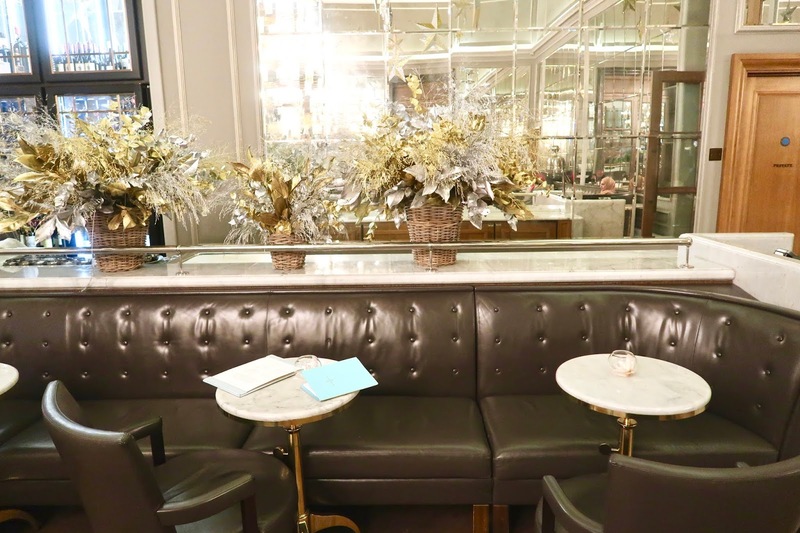 As a former Christmas Grinch, I have usually spent the previous winter seasons narrowly avoiding the festive fever that sweeps London but on Sunday afternoon I made my way to Embankment and I headed towards the Corinthia Hotel. If you are looking for hotels in Westminster for a Christmas experience, you have arrived at the right blog post. This experience was gifted by Hotels.com, but as always all views are my own. 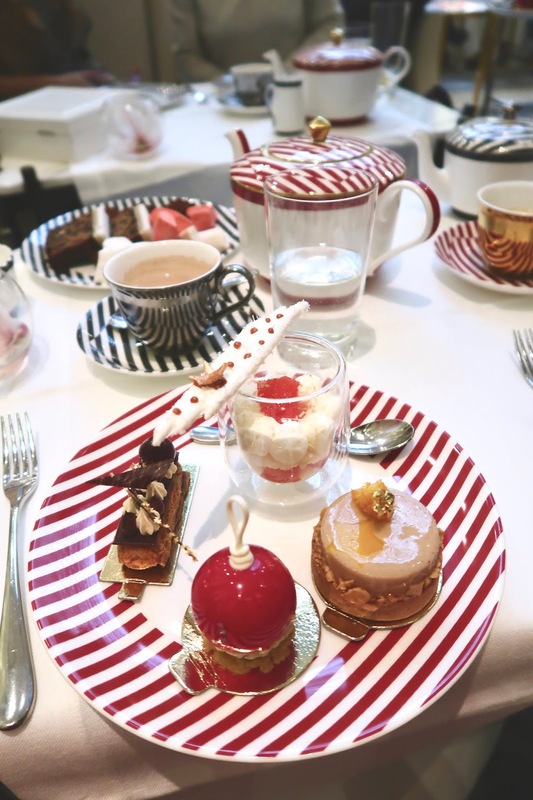 I was kindly invited to try the afternoon tea and the interior and atmosphere were a photographers dream so I may have taken quite a few photos. 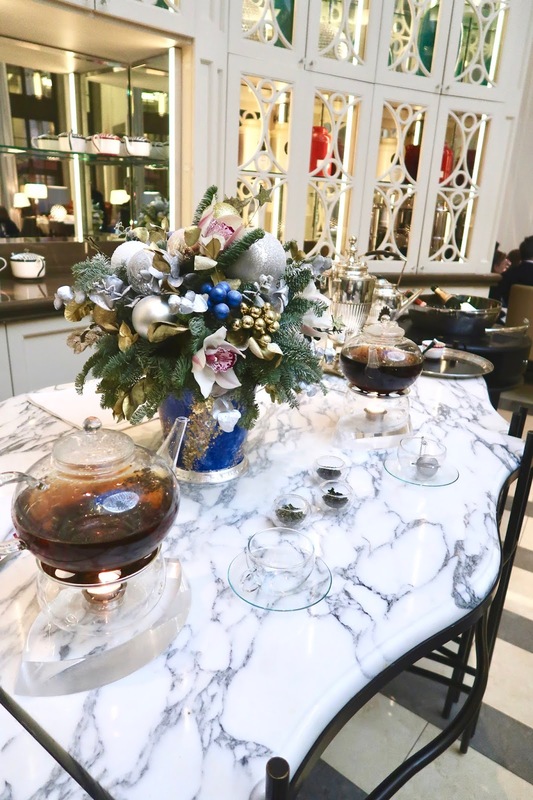 Just look at the interior - it is a fairy tale come to life, a festive winter wonderland and I feel incredibly grateful that I was invited to review the afternoon tea menu and meet a new group of bloggers to share the experience with. But I am getting ahead of myself, let's take my visit straight to beginning, before I even stepped inside this beautiful building. 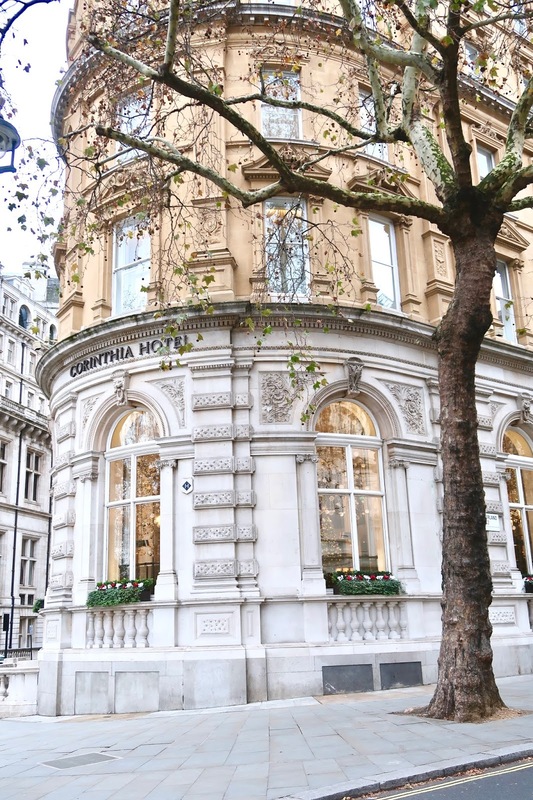 It is time for a mini history lesson because The Corinthia Hotel certainly has a few stories to tell. After doing my research, I actually discovered that for a hotel in London, the hotel is quite new. I am very lucky to live in London because I am fascinated by the history and I was really surprised to find out that in WW2, this building was actually used as a headquarters for spies during the war. 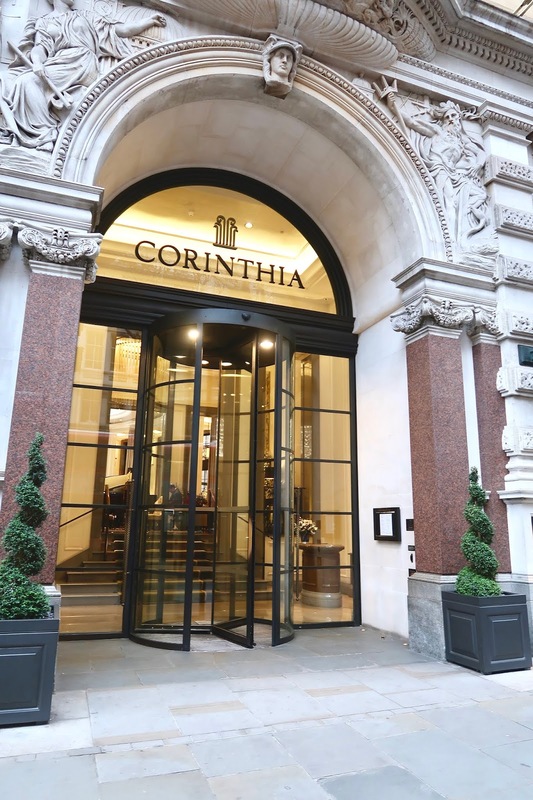 In 2008 the hotel was refreshed and refurbished by the Corinthia hotel branch and the London Corinthia has been a luxury hotel hot spot ever since. A shining beacon for glamorous celebrity events and photoshoots, the Corinthia has catered to a luxury clientele since it reopened its doors. Just this month, Victoria Beckham and Holly Willoughby have both visited the hotel. I arrived slightly earlier than 4:00pm because I wanted to take as many photos as possible and the actual building itself is just spectacular. It really is breathtaking and The Corinthia was incredibly easy to find. I made my way up the main steps and I found myself in the lobby area. From the ceiling to the floor, the entire lobby was decorated for the festive season. The glamorous tones of gold and silver carefully coloured the interior of the Corinthia entrance and it took me a moment to process the fine detailing. The ceiling caught my attention straight away, hundreds of perfectly polish Christmas baubles had been secured to the ceiling and directly beneath them, Christmas trees were placed on a glossy table. After speaking with a member of staff, I sat down in the lobby to film and capture the interior. 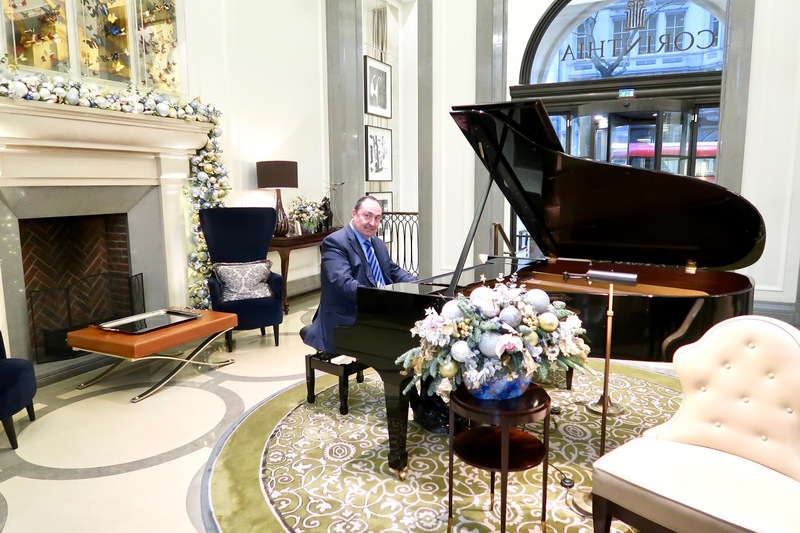 The soothing sound of the grand piano echoed around the building and for once, I felt excited for the festive season. The hotel guests arrived and departed through the main door and I saw countless Harrods, Chanel and Gucci shopping bags make their way into the elevator. It was certainly a perfect location for luxurious shopping trips. 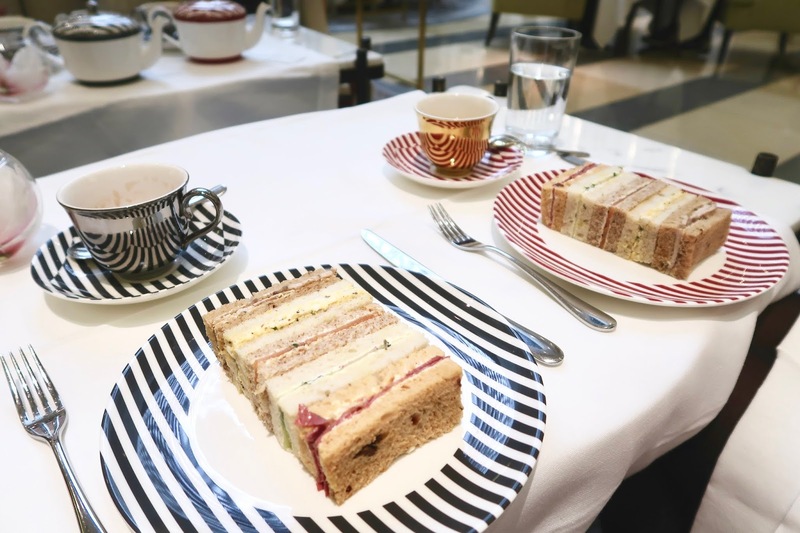 I had a date with the afternoon tea menu and as always, food was on my mind. 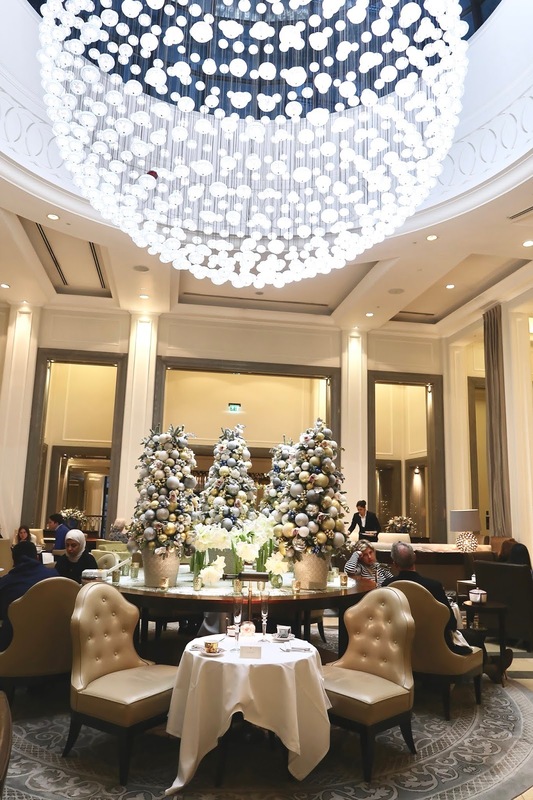 We were seated in the The Crystal Moon Lounge and the giant chandelier in the centre of the room certainly explained why the Corinthia afternoon tea is always in high demand. 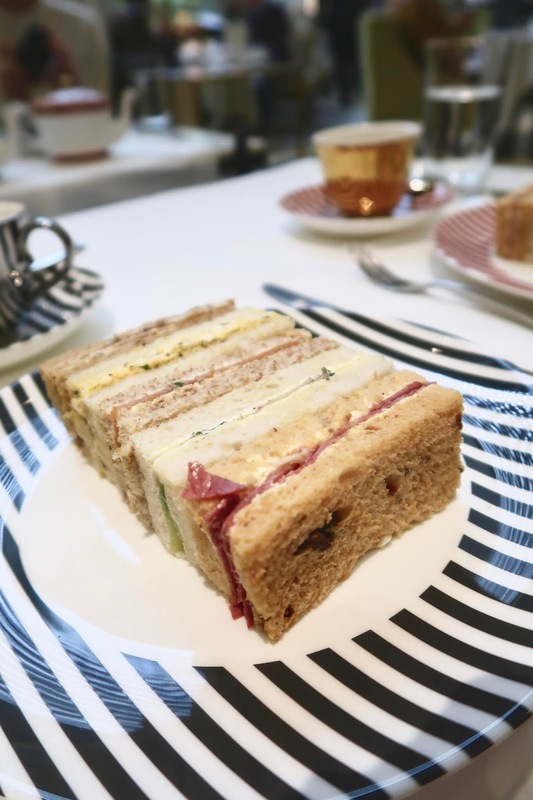 We were each handed the afternoon tea menu and I began to eye up the sandwiches right away. The afternoon tea menu includes a traditional selection of tea, from green tea to herbal infused tea - you won't be disappointed. 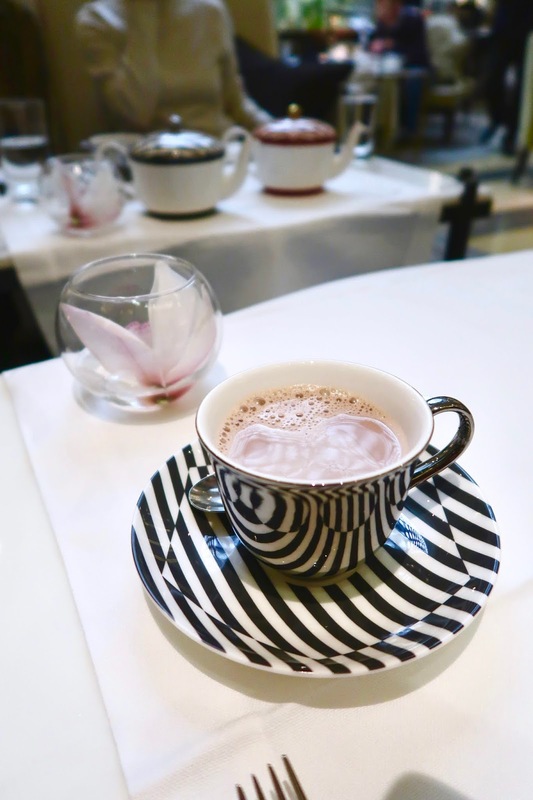 There is a style and flavour to suit your taste, whether you prefer something nutty, fruity, spicy or if you want something different - a hot chocolate is also on the menu. I actually decided to treat myself to a hot chocolate and voila, it arrived in an adorable teapot and the hot chocolate did not stop flowing. The formula was delicious, it was not too rich and it provided me with a very comforting taste for the winter weather waiting for me outside. The finger sandwiches arrived and I was completely surprised that out of all of the flavours, the egg mayonnaise sandwich was my favourite. After taking a closer look at the menu I discovered that the key ingredient was truffle - I have never mixed egg and truffle together before and my goodness, this combination is pure heaven. The other finger sandwiches included Roast Breast of Turkey, Caramelised Apple and Chestnut Stuffing on Malted Granary Bread. Severn and Wye Smoked Salmon and Marmalade Curdon Brown Bread; Salt Beef, Horseradish Cream and Watercress on Mediterranean Bread and last but not least, Cucumber, Radish and Cream Cheese on White Bread. What a selection - the sandwiches were bursting with flavour and we even ordered extra rounds of the truffle egg and the turkey and caramelised apple. A few of the bloggers had certain dietary requirements and the staff were incredibly attentive and flexible with the alternative options. The avocado sandwiches were certainly a popular choice. 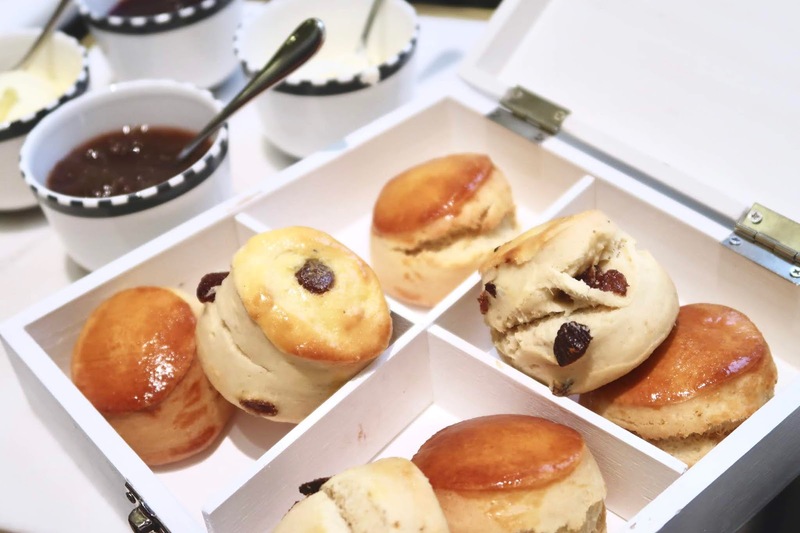 To cure our sweet tooth, the scones and desserts arrived in style. 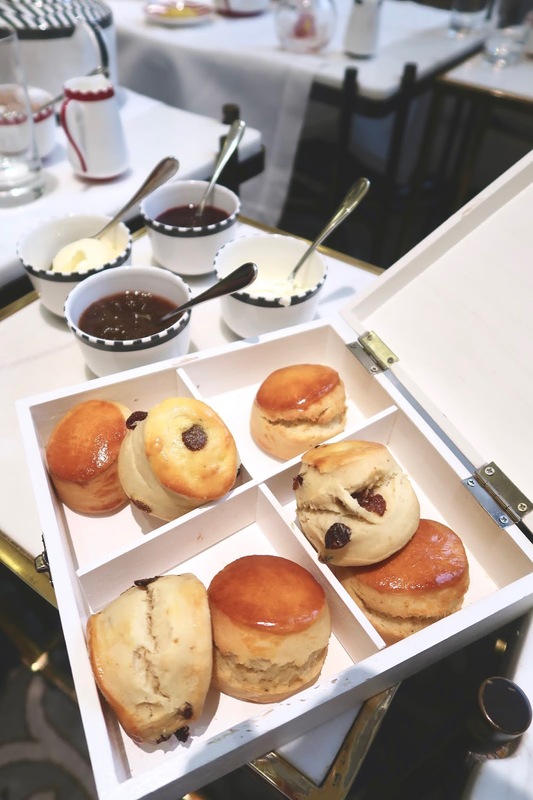 A large white box was presented with a selection of scones inside, the clotted cream was ready and raring to go. 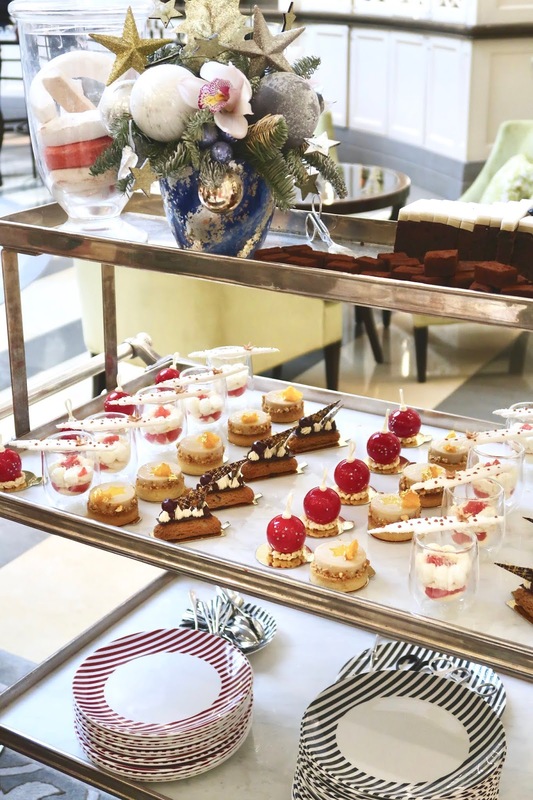 The dessert trolly arrived and we were served a selection of perfectly styled desserts. The menu included Vanilla and White Chocolate, Cranberry Snow Ball; Mandarin and Chestnut Mousse, Hazelnut Sponge; Black Forest and Cherry Tonka Bean; Ruby Grapefruit Compote with Mascarpone Chantilly and Coconut Marshmallow; Traditional Christmas Loaf Cake; Rum Vanilla Chocolate Truffles and last but not least we have the Spiced, Red Apple and Tonka Bean Marshmallows. Now just a side note, if you are wondering what to wear, I decided to wear a red jumpsuit from h&m, it is incredibly comfortable to wear and I didn't feel too overdressed. I paired the jumpsuit with a black faux fur coat from Zara and my comfortable strappy sandal heels. If you prefer to wear a pretty blouse, I saw a few people wear smart jeans and winter boots too. So what can I say? 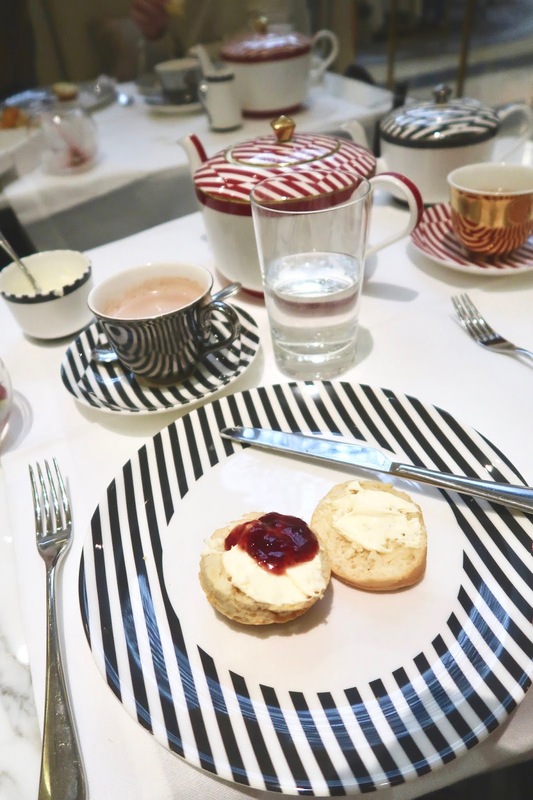 Our experience at The Corinthia Hotel was flawless. From the staff to the interior, everything is styled to give you an incredible afternoon.